About Us : News : What are we showing at the Showman's Show? What are we showing at the Showman's Show? 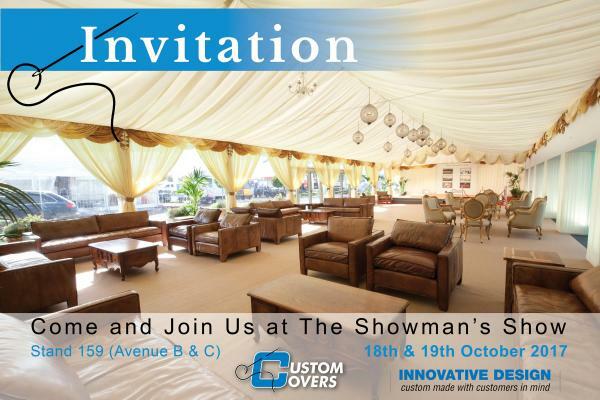 Come and Visit Custom Covers at stand number 159 on Avenues B & C at the Newbury show ground. The Tensile Traditional Marquee: Our take on a classic traditional. We’re excited to debut this tent which features an original design, with a different silhouette to anything else in the Coverspan range. What’s special about this tent? It’s a tensile structure and it’s a traditional that’s structurally calculated to European standards. You will be able to see this tent at stand 291 on Avenue F.
Our New 12m Hayling structure: This year we are showcasing an extension of our Hayling frame family. The 12m Hayling will be debuting alongside the return of the 9m. What sets the Hayling apart is its deep scalloped veranda which can be added to any standard 9m or 12m Coverspan structure to turn it into the perfect viewing canopy. 750 square metres of covered and themed space: The show stand will feature our full range of pleated linings, flat linings, tack off linings and starlight linings. Including some new additions to the range such as; a horizontal flat tack-off roof, a warmer glow LED starlight roof, two-tone flat pelmets and 2 bay Monty lined roofs. Demonstration range of Coverspan Plus framework. Steel sub frame flooring system including our trademark reversible profile. Zip together stretch linings made of our CQ stretch cloth. And much more to see, so come and join us on the 18th and 19th of October.